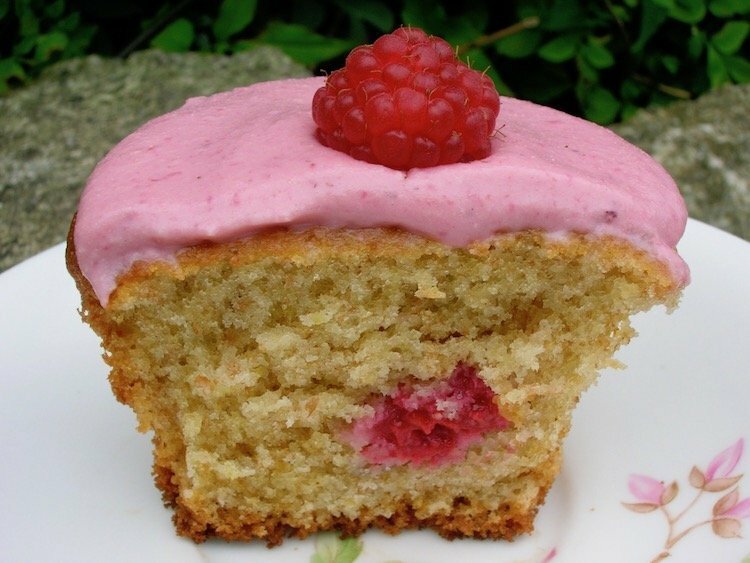 These raspberry & white chocolate cupcakes are surprisingly easy to make. They have a beautifully light sponge with a hidden raspberry inside. The tartness of the fruit creates a lovely contrast to the sweet cake when it’s bitten into. Indeed, beware, it’s quite likely to produce a close-eyes-in-ecstasy response. The cakes are topped with a decadent raspberry cream. These raspberry & white chocolate cupcakes were my contribution to a shared Transition meal. We were all asked to bring along some sort of food that was slow and local. Well I know chocolate isn’t very local, but the wholemeal flour, eggs and raspberries were. If I’d been a bit more organised the butter could have been as well. A long time ago, I saw this post for jammy doughnut muffins over at Sweet & Simple Bakes. I’ve been thinking for a long time I’d like to try a version using fresh raspberries rather than jam. It went on my must not forget list and stayed there. 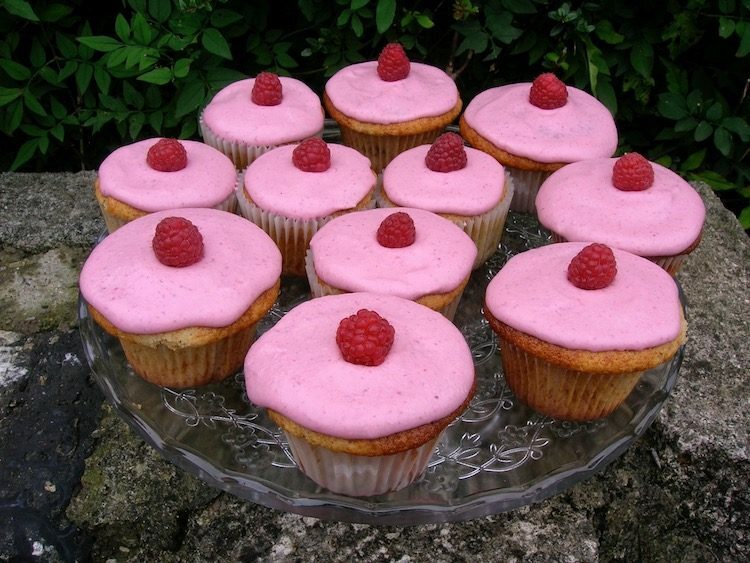 Our first ever We Should Cocoa challenge was the perfect opportunity to remember this raspberry cupcake combination. It was time to give it a try. More recently, I’ve been enjoying watching The Great British Bake Off – along with pretty much the rest of the population it seems. I was so incensed after the cake making round, however, when Paul Hollywood gave the thumbs down to the pink raspberry icing, that I was determined to thumb my nose at him and make some myself. Sometimes I like gaudy or do I mean girly? The cakes are quite easy to make with no creaming of fat and sugar required. The white chocolate raspberry cream is little more involved, but not difficult. I meant to drizzle the tops with the leftover raspberry puree, but at the last moment doubted my artistic drizzling abilities and used a lone raspberry as decoration instead. 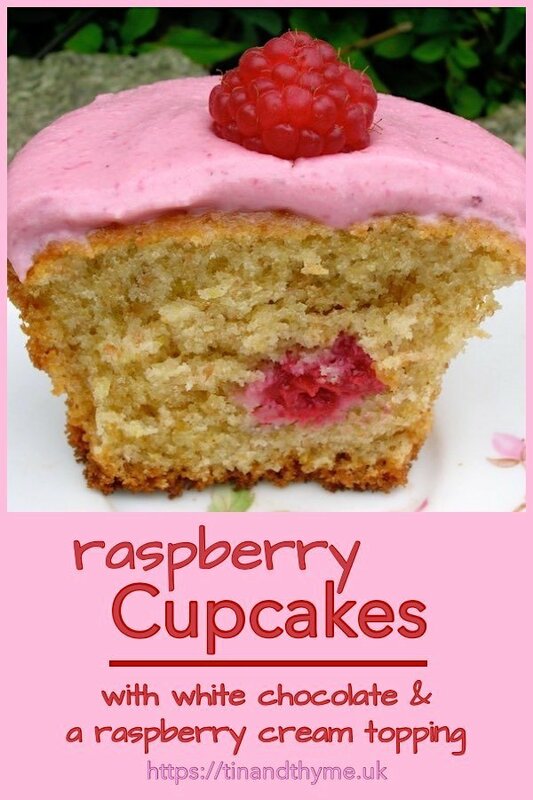 These raspberry and white chocolate cupcakes are really light yet have a nice moist sponge. The cakes are sweet but with a lovely tart tang when the hidden raspberries are bitten into. The raspberry cream is also very light, tastes fruity and is not too sweet. It make a nice contrast to the sponge beneath. They certainly disappeared pretty quickly at the Transition event. I particularly remember the pronouncement “well good”. Yum yum, I will certainly be making these again. Thanks for visiting Tin and Thyme. If you make these raspberry & white chocolate cupcakes, I’d love to hear about it in the comments below or via social media. Do share photos on your preferred social media site and use the hashtag #tinandthyme, so I can spot them. For more delicious and nutritious recipes, follow me on Twitter, Facebook, Instagram or Pinterest. If you’re looking for other cupcake inspiration, I have plenty of it here on the blog. Just click on this link for cupcakes. Fruity cupcakes with a delicious light sponge and a surprise hidden raspberry inside which are surprisingly easy to make. Topped with a luscious white chocolate raspberry cream. Melt the butter and chocolate together in a large pan over a gentle heat. Stir in the sugar, then beat in the eggs and vanilla extract. Sift in the dry ingredients, then stir in the yoghurt. Spoon roughly half of the batter into 12 cupcake cases. Place 2 raspberries in each case then spoon over the rest of the batter. Bake at 180℃ (350℉, Gas 4) for 22 mins, then leave on a rack to cool. Meanwhile, heat the cream to boiling point and pour over the chocolate. Stir until smooth then leave to cool. Blend the raspberries with the icing sugar then sieve to remove the seeds. Whisk the cream until stiff, then fold in half of the raspberry puree. Spoon this over the cupcakes, then drizzle with the remaining puree. You can easily omit the coconut flour and replace it with either wholemeal, plain or a mixture of both. They look ‘well good’! I wish you had not doubted your drizzling skills though, I bet they are good. I like the raspberries in the middle, lovely. They look so delicious! And a very beautiful pink! Don’t they look as pretty as a picture! These look delicious! Does coconut flour taste of coconut? You can drizzle reasonably neatly by putting the substance you want to drizzle into a freezer bag, then cutting off a corner – as small or large as you like. Then you can either do a controlled drizzle in a (eg) zig zag or lacy pattern by piping, or a more random drizzle by just swinging the bag over the buns or cake (see the chocolate drizzle over my ‘We Should Cocoa’ enrty for random drizzling). Kath – thank you. I’m a bit of a chicken when it comes to decorated – artistic skills were never my strong point. 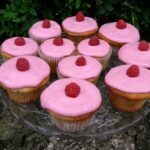 Celia – I loved the pink and I guess a few others did too as I keep being asked for the recipe. If you’re not into using food colourings, which I’m not, you don’t get the chance to have these bright colours very often. Raffaella – thank you and glad their are other pink lovers out there. Gill – from the expert that is a compliment indeed. Thanks Suelle – the coconut flour does taste and smell of coconut, but in the quantities I use it in it’s not really detectable, but I believe just adds a subtle something. I tend to use it when baking with fruit or nuts. Thanks for your drizzling tips. CUp cakes looks so lovely and yummy. Well gaudy! Love that Barbie pink and the secret raspberry centres, yum! Wonderful bake! These look delicious, the colour is so striking. Perfect cupcakes, and I must say I loved the pink icing! Gaudy/Girly doesn’t matter. That colour is gorgeous! As soon as I find me some raspberries that don’t cost a small house deposit I think The Monkeys would squeal with happiness eating these. These stunning pink topped cupcakes look just about perfect! looks so delicious I would have one right now..I also love the little pink dot in the middle. These look so great – and if we can’t be gaudy with cup cakes when can we be? Up with frivolity I say..
Lovely, great colour and looks good inside too! Is it ok to say they look slightly seaside picture postcard reminiscent of boobies? Or do I need therapy? They look lovely anyway. Your sponges always look very moist. Rosie – I was trying hard not to think along those lines. So very pretty – Im bookmarking these for my little girls birthday next year – Pink heaven! FreeRangeGirl – I’ve had requests for this icing from a little girls – well one actually. Went down very well with her. I love raspberries and I love white chocolate, these sound devine, wouldn’t last long at my house! Haha, I seem to remember they didn’t last very long when I made them. Thanks for the reminder, I must make these again. Delightfully pink. I love raspberries too.